” Say goodbye to the shoelace,” Michael Donaghu, Nike’s director of global footwear innovation told a group of influencers from stage in the company’s New York headquarters on Tuesday. This presentation was held to release Nike’s amazing new shoe, the Nike Adapt BB. The shoe is performance focused and a heavily upgraded version of Nike’s first self-lacing shoe, the Hyperadapt 1.0, which was just built for general consumers. The BB in the name stands for “Basketball” because the shoes were meant to be played in. The new shoes is also all about fit, Donaghu said, which is something at the top of the mind of the players. The shoe allows for minute changes in tightness and color of the twin dots on the side of the shoe with a choice of 14 colors, this all happens through a companion app, leading to 40% more “lockdown” for your feet in the shoes. Nike’s old self lacing shoe the Hyperadapt 1.0 were controlled by buttons on the side of the shoe, and for the new Nike Adapt BB shoes are controlled by the app and that is the only way to control them. The new shoe is targeted directly towards basketball athletes. Nike will start to release the shoe in February for $350 which are less than the Hyperadapt 1.0 which had a retail price of $750. 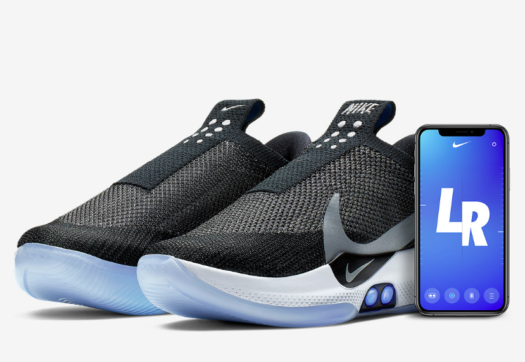 The Nike Adapt BB also comes with a wireless charging mat, which can charge the shoes in three hours for two weeks of wear time.